While most people think Manhattan when they think about NYC shopping, Brooklyn’s shopping centers offer everything you could want in a shopping experience. Whether just going out for a quick item or two, or you’re going to “shop until you drop,” check out these major shopping hubs where you are sure to find everything you need…and more! Gateway Center – 501 Gateway Drive, Brooklyn, NY; Phone: 718-235-0467 The Gateway Shopping Center is located in eastern part of Brooklyn, specifically East New York. This shopping center is right next to the Belt Parkway with easy access to it from the main thoroughfare in this part of the city and has some of the larger chain stores including Marshall’s, Target, BJ’s Wholesale, Home Depot, Bed Bath and Beyond, Staples, and a Kid’s R Us. There are plenty of other service stores as well, and you’ll find three popular sit-down restaurants such as Olive Garden, Red Lobster, and the Boulder Creek Steakhouse. Atlantic Center – 625 Atlantic Avenue, Brooklyn, NY The Atlantic Center shopping center is in the Fort Greene area of Brooklyn at the end of the Atlantic Avenue retail walk near 4th Avenue. 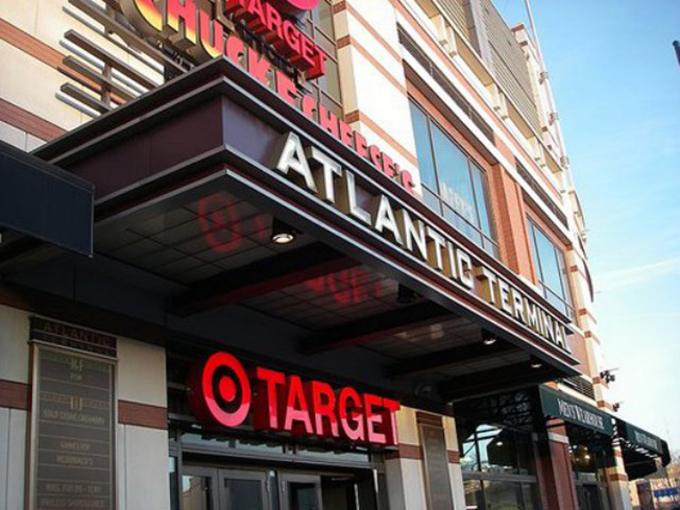 This Brooklyn shopping center has many of the top-name chain stores, including shops like Target, Victoria’s Secret, Bath & Body Works, Daffy’s, Old Navy, Best Buy, DSW, and Payless Shoe Source. Whether you need to pick up clothing, electronics, jewelry, office supplies, or cosmetics, The Atlantic Center is the perfect place for all-day, one-stop shopping. There are plenty of eateries to choose from as well, and they even have other services such as a dental office, Carver Savings Bank, and a branch of the DMV. Kings Plaza – 5100 Kings Plaza, Brooklyn, NY; Phone: 718-253-6921 Kings Plaza Shopping Center has been around since 1970 and can be found just a short distance off the Belt Parkway at the intersection of Flatbush Avenue and Avenue U. This Brooklyn shopping Center features 120+ stores and restaurants, with main store chains such as Sears, Macy’s, Best Buy, H&M, and Old Navy. It was extensively renovated in 2001and is the largest such shopping center within the borough of Brooklyn. There is parking available onsite for a small fee.